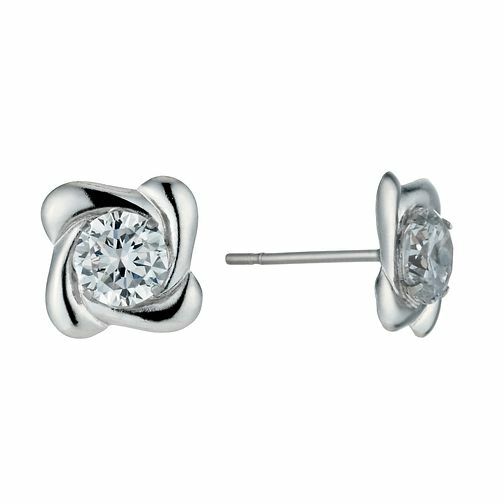 A classic pair of cubic zirconia stud earrings are given a unique twist with a swirling, 9ct white gold setting. Perfect as a timeless gift, these earrings give a touch of sparkle to any outfit. 9ct White Gold 5mm Cubic Zirconia Swirl Stud Earrings is rated 2.0 out of 5 by 2. Rated 1 out of 5 by Anonymous from lovely design but … These earrings look lovely but the quality is shockingly poor. The gold is so thin that it bends without any force including the posts which have the tiniest butterfly backs I've ever seen. Would not recommend.